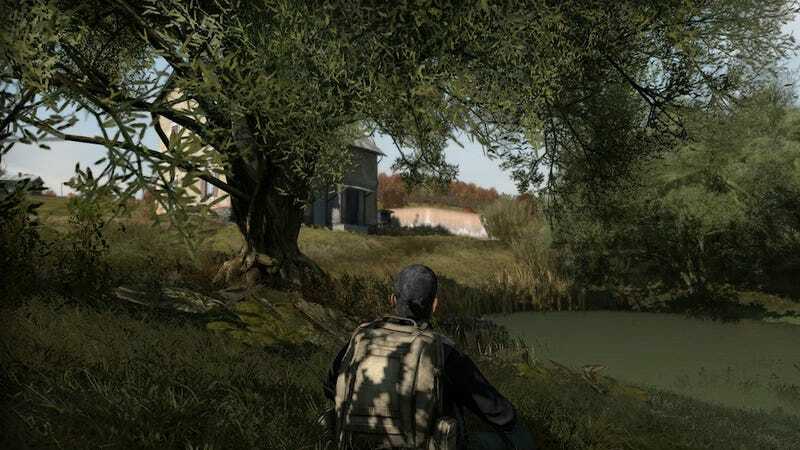 We have known since August that the enormously popular Day Z mod to Arma II would be developed into its own stand-alone game. Today at the Eurogamer Expo, Developer Dean "Rocket" Hall confirmed that the game will be available by the end of the year, and it will be inexpensive to boot. Eurogamer reports that in a presentation at the Expo, Hall explained that the team hopes to have the initial game available by December, with refinements and additional features to follow into early 2013. The rush to production isn't just from a desire to get the game in front of players; it stems from a need to get the game in front of players before copycat games get made, Hall said. When asked about clones and similar games, particularly The War Z, Hall instead focused on what Day Z can offer, mentioning that his personal feelings toward other games weren't really important: "Should I sue anyone who ever mentions something to do with zombie horror - will that make a better game? And the whole premise of of DayZ, and the whole premise of our development is we're going to make an awesome game. That's what we're selling. We're going to price it low and lots of people are going to play it. If we compromise on that, we're screwed." He also added that taking on hackers, performance optimization, and bugs are the team's top three priorities. He also outlined a number of features that Day Z will have, including, "diseases spreading through feces and vomit; removing the user interface; using household weapons; allowing people to craft splints to help mend broken bones." He also mentioned that vehicles would be one of the longer-term features the team planned to implement. December feels like it should be farther away than it is, but for now, it looks like a Day Z game is only three short months away.